Size: 5.6" x 7.4" x 1.3"
The TI-5021 was introduced in the year 1988 and combined a huge 12-digit display, a convenient keyboard and a small clock in a stylish desktop style housing. Instead the huge solar cells of the TI-5020 this one uses a single AA-sized battery for both calculator and clock module. The TI-5021 addresses both home and office use and features even an item counter [IC] key and margin up/down [MU/D] functions. The internal construction of the TI-5021 is based on the Toshiba T6897 single-chip calculator circuit and a self contained clock module. 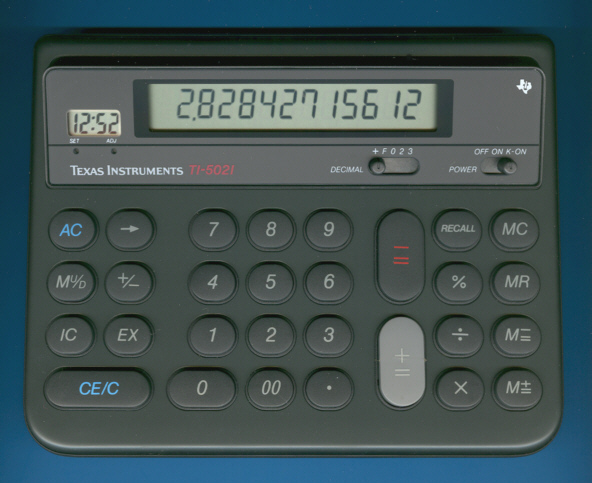 In 1993 a more or less identical calculator was introduced with the TI-5021 SuperView™. The design of the TI-5021 matches with the TI-5038 introduced in the same year. The TI-5021 is featured in the Texas Instruments Incorporated bulletin CL-962A dated 1988 and the sales catalog CL-1233 dated 1994.